We went on a Sunday for lunch. We were seated right away, since we were a small party, only three. The restaurant is a large old two-story Spanish-style building, I have a feeling it was added on to over time, with a large inner courtyard decorated in beautiful Spanish tile. The overall decor is old woodwork stained dark, pristine white stucco walls, colorful Spanish tile around the door frames and on stairs, terracotta tile floor, and black and white family photos of multiple generations of owners in gilded frames densely covering the walls. It is a white table cloth restaurant, yet the atmosphere is casual and relaxed. 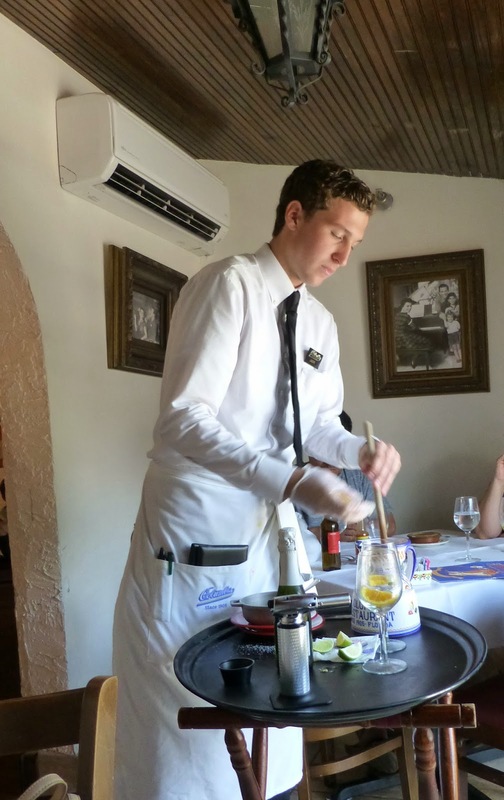 The waiters wear a white button-down shirt with black tie and black pants for men, or black tight skirts and black stockings for women. We were seated in a small semi-private room upstairs with large windows that let in plenty of natural light. The space only held three tables, and was nicely air-conditioned. They have a kids menu, but Danny likes seafood so he had crab cakes off the main menu. There were two on a plate, with a little mustard sauce, they were large and delicious. We took one home and it reheated perfectly for Danny's dinner. We were also served Cuban bread while we were waiting for our food to arrive, Danny ate not only his portion (it's half a loaf) but mine as well. It has a crispy thin, almost papery, toasted crust and a soft flaky inside. It was served warm, wrapped in paper, with a side of room-temperature butter. We had a pitcher of White Sangrias, which was prepared tableside. The pitcher can be purchased at the gift shop, and of course it went home with us. I discovered at home that it was made in Spain. 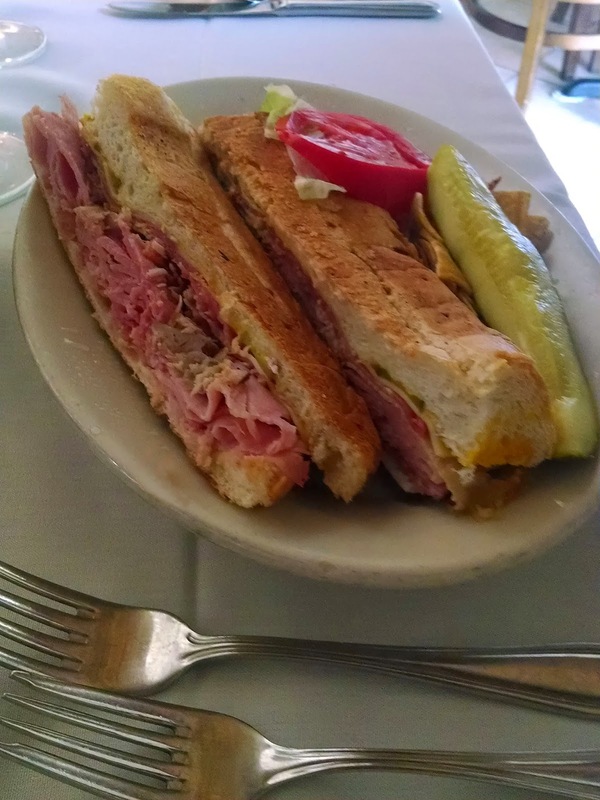 We did order the Cubanos, because that why we were there, but the menu is extensive and I was extremely tempted to deviate. The Cubano was delicious! Everything we imagined and more! The unexpected best part were the plantain chips served as a side, I am now addicted. One sandwich can serve two people actually, almost everyone takes a half home. The best part of the meal, however, was the dessert. While we were waiting for our Sangrias to arrive, the table next to us got a crème brûlée. It was not only large, but finished off tableside as well. Terry loves crème brûlée, so of course we ordered one for him as well. The waiter was kind enough to let me capture his performance. First, a nice layer of sugar. Then, a nice strong blowtorch to caramelize the sugar. I had a flan. It was the prefect size and the caramel sauce was not watery. We will definitely be returning every time we visit St. Augustine. There are also several locations in and around Tampa (including the original) so if we're ever out that way, we will also be dining there. Our stylist suggested a paella for our next visit. I saw the pans in the gift shop, I have a feeling I will be walking out with one of those next time as well, along with their cookbook. I suggest reservations. Take-out is available as well.